Silas will still be around. So will Tessa, the character played by Janina Gavankar who debuts on tonight's "Original Sin." And so will Dr. Maxfield, whose agenda remains a mystery. 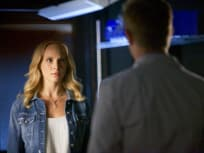 Silas happily announces his new goal to Damon and Elena, but they are skeptical when he promises to accomplish one important task in return for their help. Tessa (guest star Janina Gavankar) confidently tells Stefan about her next move, then realizes that Silas has managed to outsmart her. A desperate Katherine discovers a new and unexpected consequence of becoming human again, and realizes she needs a new place to stay. 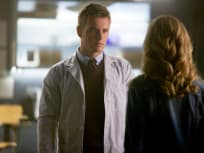 In exchange for a spot in the dorm room, she offers to show Caroline how to get answers from Dr. Maxfield (guest star Rick Cosnett). Bonnie is touched by Jeremy’s strength and determination to stand by her. 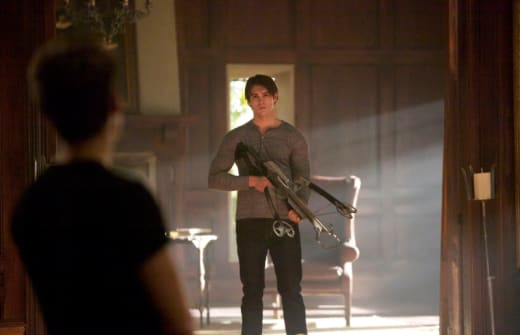 Finally, Damon is stunned when he figures out the secret to Tessa’s plan. Elena: You're kind of evil. No offense. Quiet, still, peaceful. I like our life like this. Permalink: Quiet, still, peaceful. I like our life like this. The Vampire Diaries Music: "Handle with Care"
The Vampire Diaries Round Table: "Handle with Care"
The Vampire Diaries Clip: It Will Work!